Part fact, part fiction, Tyehimba Jess's much anticipated second book weaves sonnet, song, and narrative to examine the lives of mostly unrecorded African American performers directly before and after the Civil War up to World War I. Olio is an effort to understand how they met, resisted, complicated, co-opted, and sometimes defeated attempts to minstrelize them. they echo a hymn's haven from slavery's weather. Detroit native Tyehimba Jess' first book of poetry, leadbelly, was a winner of the 2004 National Poetry Series. Jess, a Cave Canem and NYU Alumni, has received fellowships from the Whiting Foundation, National Endowment for the Arts, Illinois Arts Council, and the Provincetown Fine Arts Work Center. Jess is also a veteran of the 2000 and 2001 Green Mill Poetry Slam Team. He exhibited his poetry at the 2011 TEDxNashville Conference. Jess is an Associate Professor of English at College of Staten Island. 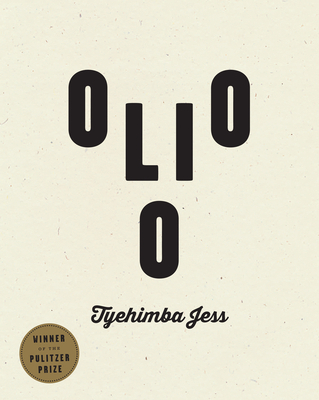 Detroit native Tyehimba Jess' first book of poetry, leadbelly, was a winner of the 2004 National Poetry Series. Library Journal and Black Issues Book Review both named it one of the "Best Poetry Books of 2005." Jess, a Cave Canem and NYU Alumni, received a 2004 Literature Fellowship from the National Endowment for the Arts, and was a 2004-2005 Winter Fellow at the Provincetown Fine Arts Work Center. Jess is also a veteran of the 2000 and 2001 Green Mill Poetry Slam Team, and won a 2000 - 2001 Illinois Arts Council Fellowship in Poetry, the 2001 Chicago Sun-Times Poetry Award, and a 2006 Whiting Fellowship. He exhibited his poetry at the 2011 TEDxNashville Conference. Jess is an Associate Professor of English at College of Staten Island.